This stoneware baker / roaster is 4" deep, making a pretty presentation for home-cooked casseroles, meats, stews, and more. As always with Polish Pottery, this large stoneware baking dish with lid goes from the oven directly to the table keeping your food hot and beautiful! 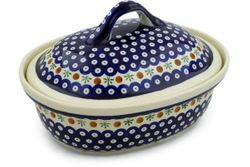 This Polish Pottery Baking Dish can be placed in the dishwasher and microwave, and is also chip-resistant and lead-free. The cleanup couldn't be easier - nothing sticks! For best results avoid sharp temperature swings: cold to hot or vice versa.